A. 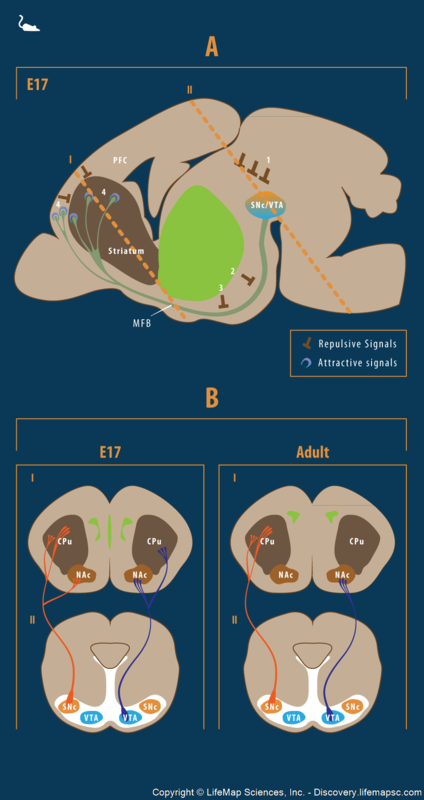 A sagittal section of the E17 rodent brain demonstrates the path taken by the Substantia nigra pars compacta SNC and the ventral tegmental area VTA dopaminergic exons towards their targets in the telencephalon. These meso-diencephalic dopaminergic neurons begin to extend processes at E13. These processes initially encounter repulsive signals (e.g., slits) from the dorso-caudal striatum (1) and adopt a rostro-ventral orientation. Once they elongate further and exit the mesencephalon towards the telencephalon, the processes fasciculate into two large axon bundles called the medial forebrain bundles (MFBs). Repulsive signals from the diencephalic midline (2), such as Slit1, Slit2, Sema3A and Sema3F, and from the hypothalamic region (3), such as slit2, maintain the bundle tight and direct it toward a ventro-lateral position. Finally, attractive signals from the target areas in the striatum and the prefrontal cortex (4), serve to guide the axon tips to their correct locations, as exemplified by Netrin-1 expression in the striatum and the PFC, which attracts Dcc-expressing neurons. Green area=diencephalic structures. The dashed lines indicate the location of the sagittal sections presented in panel B of the image. Abbreviations: MFB, medial forebrain bundle; PFC, Prefrontal cortex; SNC, substantia nigra pars compacta; CPu, caudate-putamen complex of the striatum; NAc, nucleus accumbence of the striatum.